About meI have been active in defending science education against the attacks of antievolutionists for the last 22 years. I am something of a minor expert in the creation/evolution debate and the author of the blog Playing Chess with Pigeons. I am a member of the National Center for Science Education, the Skeptics Society, and a founding member of the McLean v. Arkansas Documentation Project. In the past I was also a volunteer at the Talk.Origins Archive answering feedback questions. 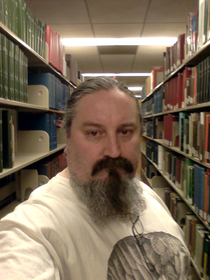 About my libraryMy collection is organized using the Library of Congress classification system, with one exception; I put books by creationists/antievolutionists/anti-Darwinists, and some other pseudoscientific works into the category of Antievolution literature. GroupsCreation vs Evolution, Evolution, Evolve!, Science!